Next week we’ll go to London for seminars at Queen Mary and De Montfort. We’ll also do a mixing session with Gary Bromham, to experiment with the crossadaptive modulation techniques in a postproduction setting. For this purpose I’ve done a simple session template in Logic (as it is a DAWs that Gary uses regularly). Logic session with two tracks, EQ being applied to track 2, controlled by pitch analysis of the signal on track 1. 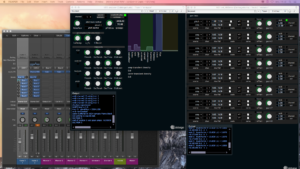 Reaper (running the analysis and modulator routing plugins) can be seen in the background. The jack patching can also be seen in the lower right part of the image. To keep the Logic session as clean as possible, we will do the signal analysis and preparation of the modulation signal in Reaper. 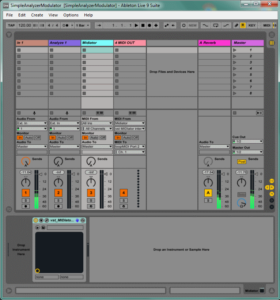 This also allows us to use the VST versions of the plugins for analysis and modulation mapping we’ve created earlier. (It should be possible to use these as AU plugins too, but that is somewhat more experimental as of yet). Signal routing between Logic and Reaper is done via Jack. This means that both Logic and Reaper use Jack as the audio driver, while Jack communicates with the audio hardware for physical I/O. 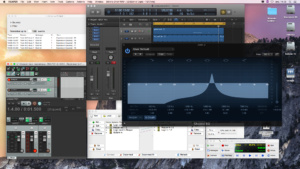 The signal to be analyzed (guitar on track 1 in our Logic session) is fed to a separate bus track in Logic, and the output from this track is sent to Reaper via Jack. We analyze the pitch of the signal in Reaper, send the pitch tracking data to the vstMIDIator plugin, and route the MIDI signal from Reaper back to Logic via the IAC bus. In Logic, it is relatively straightforward to map an incoming MIDI signal to control any parameter. You can find this in Logic Preferences/Automation, where there are Learn and Edit buttons towards the bottom of the dialog. To learn a mapping you will touch the desired destination parameter, then send the midi message to be mapped. In our example, we use an EQ on vocals (track 2), and control the frequency of a narrow band in the EQ with the MIDI modulator signal. This way the pitch of the guitar controls the EQ for the vocals.